Long advised to have registration fees and sponsors, Balbi has instead kept the event bare-bones, determined that anyone can hop on a bike that day and ride for the fun of it. Hosting the event early in the season fuels the hope that cyclists will enjoy the experience and do it all season long. 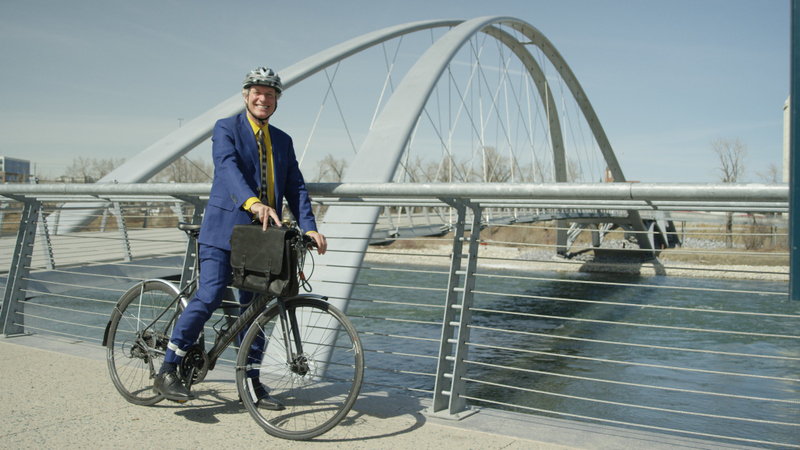 Utilizing Calgary’s well-established bike paths and a growing network of protected bike lanes on downtown streets to get to his own office, Balbi recognizes that safety concerns continue to be a barrier to increasing cycle ridership. Bike to Work Day offers fellow riders on paths and roads, with event partners hosting ‘energy pit stops’ along the way—refreshments and bike tune-ups included. There’s even a free pancake breakfast, giveaways, a draw for a free bike and cycle-related vendors and merchandise to entice Calgarians to get on their two-wheelers and ‘feel like a kid’ again. Balbi sweetened the pot this year by offering to donate $1 for every participant to a local, cycling-related charity. There’s momentum to be sure, with some downtown companies even offering a bike for employees to get to meetings in the core. School groups have increasingly joined in for the day’s events too.